The abuse of women does not stop or ‘get better’ with age–in fact, it often gets worse in later life. What’s Age Got To Do With It? is a riveting video that brings the often-overlooked issue of abuse and violence against older women to the forefront. 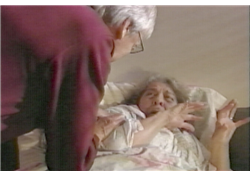 The video addresses the verbal, physical, sexual, and financial abuse that many older women face from spouses, adult children, and other family members. It looks at the manner in which emotional and psychological abuse erode feelings of self-worth over time, and documents the fact that domestic violence in later years in usually a continuation of long-term abuse. What’s Age Got To Do With It? is an extremely useful and new resource to help healthcare and other service providers recognize signs of abuse and respond to the needs of abused older women.